High and low position for the two decks. Handle for operation and lower drive can be build on opposite side. 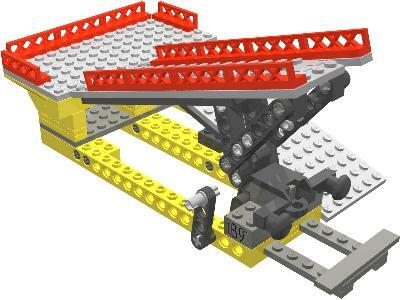 Nearly seamless connection between the drive and the lowered gates of the wagon through ingenious mechanism to extend the drive for the upper deck. Model can be connected to standard 9V or RC track.